Back in February, I decided to spend an entire week in fancy dress. I put together a different costume for every day and went to all my lectures, seminars and other university-related things dressed up as whatever I had chosen to be. One of my costumes was the Other Mother from Neil Gaiman’s ‘Coraline’, and I was astonished to find that Mr Gaiman had shared the picture I had sent him with all his followers. Once I had finished with my several minutes of frantic hand-flapping, I saw that many people were interested in seeing how I put my costumes together. This is the first of those posts. My first costume had originally been planned to be Ramona Flowers from the Scott Pilgrim series, but due to unforeseen circumstances – which I shall cover in a later blog post – I had to switch at the last minute. 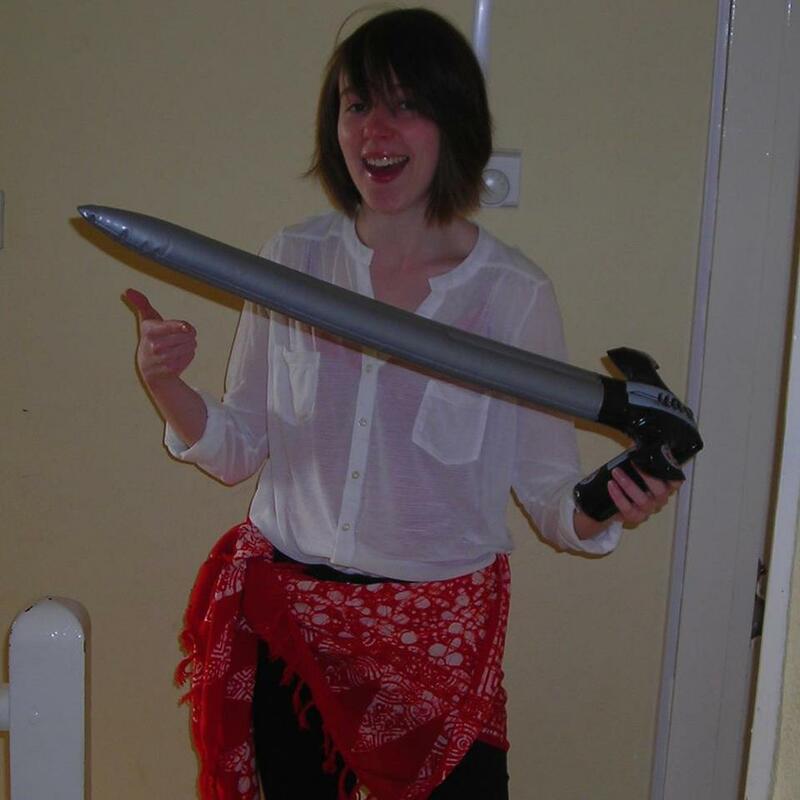 The costume I ended up wearing on the first day of my fancy dress week was a generic pirate costume. The costume was easy enough to put together. I didn’t take this one quite as seriously as some of the other costumes, and because I wasn’t making a replica that left a lot more open to interpretation. I looked to the spate of recent pirate movies and famous female pirates like Anne Bonney for inspiration, but eventually I chose something which was more practical than accurate. I wore a baggy white shirt (with vest underneath for added warmth/chastity), black trousers, black boots and a red scarf tied around my waist. I stuck a grey military jacket on top to keep me warm, but I forgot to include that in the picture. I only had to buy the shirt and I was able to pick it up pretty cheap. Everything else I found lying around my house (including the inflatable sword). However, I wasn’t completely happy with this costume. It was actually pretty difficult for people to guess what I was dressed as due to my lack of pirate hat; I didn’t expect it to be quite as central to the costume as it turned out. Furthermore, I was absolutely freezing for the entire day. My shirt was clearly never intended to be worn as a shirt – perhaps as something that could be layered with rather than worn by itself – and also turned out to be a little bit see-through. The scarf I had tied around my waist also produced a rather large knot. For most of the time this wasn’t a problem, but when it was covered up with my coat it produced a highly-suspicious looking bulge so I had to move the knot to just above my hip-bone. All in all, it was a decent costume. It wasn’t immediately obvious who I was, but that did mean that I could pass for a relatively normal-looking person if I wanted to. I didn’t end up spending a lot of money on this one, and the stuff that I bought can (and has) been worn again. It’d probably be a bit more suitable for a student party than for serious cosplay, but it did the job all right. Ah, the bake sale. The main weapon in every fundraiser’s arsenal. And – coincidentally – the subject of this latest blog post. I have just returned from a cake sale at the Loddon and Beccles Kuk Sool Won group, and have added another £73.77 to my fundraising total. Thank you very much to everyone involved, I really appreciate it! On the surface, the cake sale seems like a foolproof fundraising strategy. After all, who can honestly say that they can resist delicious cake? And seeing as all the profits from a cake sale usually go to charity, buying a cupcake is practically the equivalent of wiping clean a corner of your karmic slate. They might not be good for you, but they’re good for your soul. Think of them as the tiny, delicious equivalent of a Papal indulgence. Choose your time and place carefully. The ideal time to set up is before a traditional meal time; the earlier the better. Place is equally important: no-one will buy a cake from you if you have set up next to a restaurant. Spread the word before the event. That way more people will know about your cause, and they’ll also be more likely to remember to bring change. Provide a range of goods. 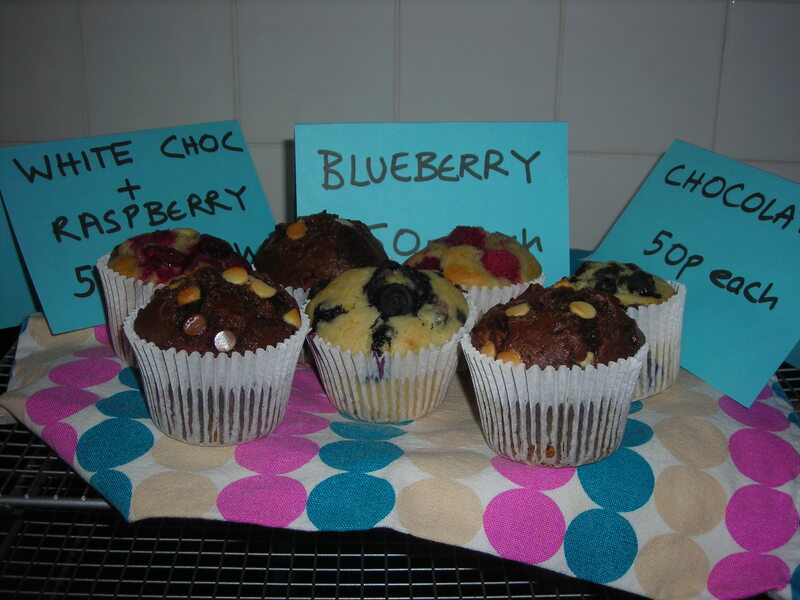 I chose muffins, and I helped to make three different kinds – I had people asking to try one of each flavour when I was running the stall! I also had access to a kitchen, which meant I could provide people with hot and cold drinks, and bacon rolls when it got closer to lunchtime. Spend a little time on presentation. Label your prices clearly and lay your things out as neatly as you can. I learned this one from experience: I ran a bake sale last year where I sold rather messily iced buns, and they didn’t sell nearly as well as this year’s! Don’t eat the goods. Really, don’t do it. You’ll just feel guilty afterwards. This summer, I’m going to walk the Inca Trail to raise money for Practical Action. In order to get there, I need £2850, all of which will go directly to the charity. Yikes. That is a lot of money. For those of you who don’t know, Practical Action is a really fantastic charity that funds development projects all over the world. Their projects range from providing clean water that is safe to drink to building up infrastructure such as transport, urban planning and effective waste management. It’s a UK-based charity but their projects are based in the Sudan, Bangladesh and Peru, to name but a few. As for the Inca Trail, it’s a monster. I’ll be going through the Lares Valley and on to Machu Picchu, reaching altitudes of more than 3660 km above sea level. The trek ends at the Sun Gate of Machu Picchu, and I’m willing to bet that as I enter the majestic ruins of the Inca city I’ll be on the point of passing out. Over the next few months I’ll be writing up my fundraising efforts. So far, I’ve gone to a week of lectures in fancy dress and operated a Valentines’ Day Delivery service, and I’ll be discussing the merits of both of those events and giving any tips to future fundraisers. I’ll also be doing a breakdown of my fancy dress week, including giving details of how I put together my five costumes and didn’t break the bank! Thanks for your support and wish me luck!